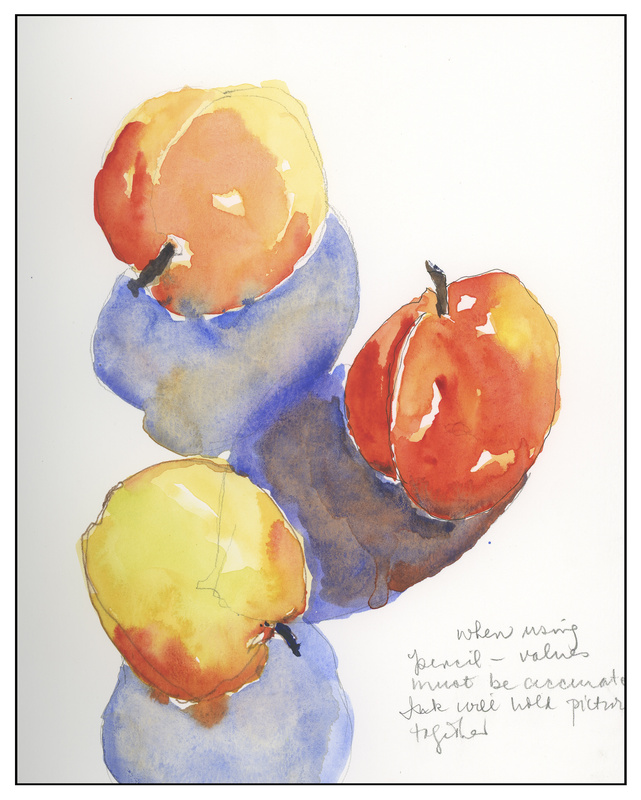 I was lucky enough to get a spot in Brenda Swenson‘s watercolor workshops in the Los Angeles area. I was waitlisted and got unwaitlisted. Now I am thoroughly enjoying myself! Today was the first day. 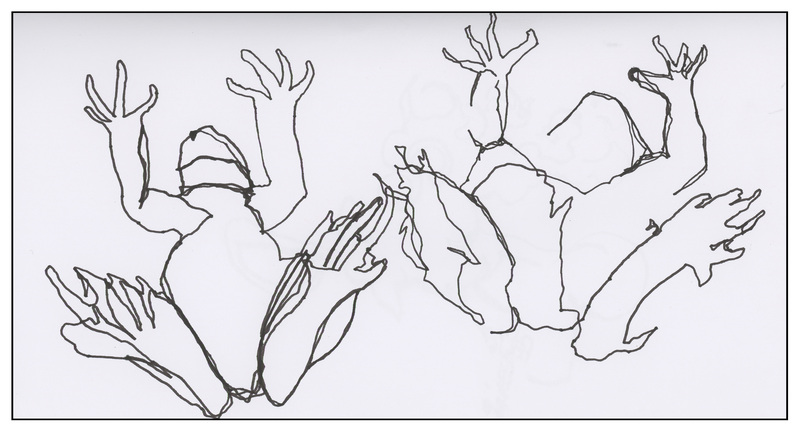 We started out with loose, continuous line drawings. Start and stop, but never lift up the pen. The point of the exercise is to create “lost edges” – leave out a line and let the mind fill in the rest. While not the first exercise, we did this one to compare and contrast the interest that comes with lost edges. The study on the left is an upside-down plastic frog. Drawing all the outlines and then some – not too exciting. The second one, while not especially great, gets the point across: lost edges give you something to participate with in the drawing. More studies followed. I did a clove of garlic, a packet of string, and a David Austin-esque rose. I like all of these, but the rose is my favorite. We could only spend three minutes for each picture. Something to think about: how much time do you have to do a drawing or a painting? I must say I never considered that. From drawing with lost edges, we moved on to painting with lost edges. We did ink sketches and then used watercolor. In watercolor, the lost edges work their magic while the paint is wet, and the artist judiciously touches one wet color to another, allowing the colors to bleed into one another. In particular, Brenda pointed out how this works for shadows, especially for reflected light, form shadow, and even (but lesser) for cast shadows. She said she pays a great deal of attention to shadows . . . I never really thought about shadows quite so much! Below are two I did. The one with the apricots worked out well, I think; we did three 3-minute sketches of the same object in ink or whatever, and then penciled in the shadows prior to painting. Finally, while I was rather impatiently waiting for areas of this image to dry, I did a casual sketch of a carrot, working to create lost lines and bleeds. I just did it freehand with a brush over a line drawing I had done earlier in the session. Serendipity sometimes works in your favor! Tomorrow, painting from photographs . . . and a critique. Eek! Nicely done, love the loose style.